If you suddenly find yourself without hot water, one of the first things to check is the water pressure. There should be a pressure gauge on the front of your boiler, although you may sometimes need to remove a panel to view this. 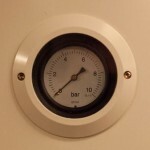 A boiler should normally have a water pressure of between 1-1.5 bar. If the pressure drops much below 1 bar you won’t get any hot water. If this is the case, the first step is to repressurise the system by adding more water back in, which is usually done with a key, button or switch depending on the type of boiler. Please refer to your manufacturer’s instructions for guidance on how to do this or, if you no longer have these, contact the manufacturer directly with the make and model of your boiler. If your system keeps losing pressure, however, even after you have repressurised it, there is likely to be a more fundamental problem that will need addressing. The following are the two most common causes of lost pressure and how to spot them. If your central heating is losing water pressure that usually means it is losing water. This could be due to a leak somewhere in the system, which is not only bad for your water pressure, it could end up causing damage to your home. The best way to identify a leak is by checking all parts of your system, including all pipework and radiators. Places where different parts of your system are connected together are the most likely culprits, so make sure to check anywhere pipework meets or is joined to a radiator, including all of your valves. It’s also worth carefully checking over your radiators as these can sometimes develop leaks anywhere on their surface due to corrosion. Bear in mind that even if you can’t see any evidence of water leaking from your boiler or central heating system, it could still be happening in places you can’t access, like under the floor. It is still highly recommended, therefore, that you contact a reliable plumbing and heating engineer at the earliest opportunity. The other thing to check is that there is no issue with your boiler’s pressure relief valve (sometimes called the overflow). This will generally be connected to a pipe leading from your boiler to the outside of your house. Once you’ve identified where this pipe is, check to see if it appears to be dripping regularly. If this is the case it may be that the valve is faulty, causing it to allow a small but continuous flow of water out of your system. Over time this will lead to the water level in your system dropping significantly and causing the overall water pressure to drop. This means that every time you repressurise the system, the water you add will simply leak out again, causing it to slowly depressurise. Ultimately, whatever is causing your boiler to lose pressure, if it keeps happening the problem is only likely to get worse over time. The longer you leave the problem, the more like it is to result in even bigger problems, including the possibility of a complete boiler breakdown. So if your boiler is constantly losing pressure it is vital that you get it checked as soon as possible by a competent engineer. DHS offer first-rate boiler servicing in Bristol and the surrounding area, so if you are having issues with your system, please don’t hesitate to get in touch. Remember, it is usually cheaper to fix a problem the sooner you identify it and call in help.